Please read this comic first. Otherwise, this post won't make much sense to most people, because the reigning myth about Christopher Columbus is largely false. Done? 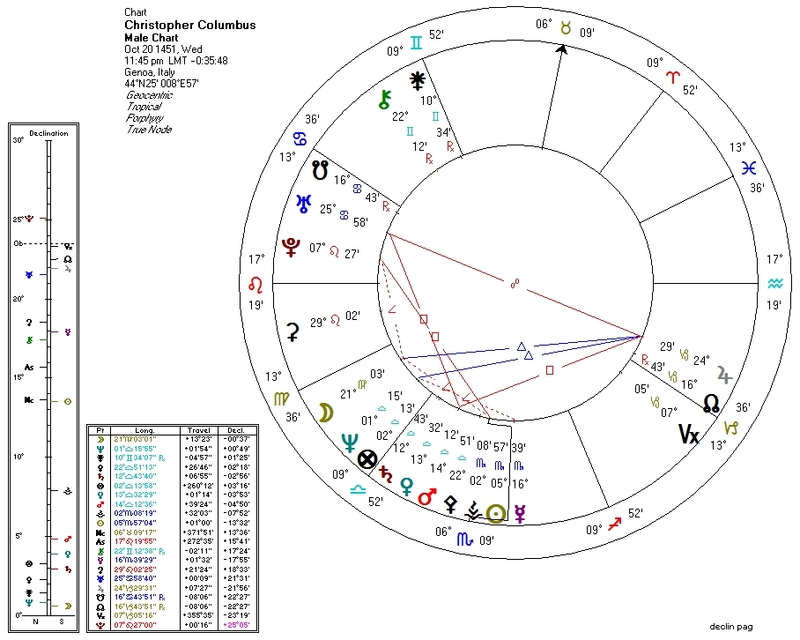 OK. Now we know that Columbus was essentially a prototypical Communist dictator, we can look at his astrological chart in the proper context. Pallas/Ethics: Pallas is square Jupiter which is hyped-up by a conjunction with the North Node. We know that Pallas in discordant aspect to Jupiter with no mitigating factors basically erases the native's ethics. Venus/Second-House/Economics: Neptune is in the Second House and is widely conjunct Venus. The Second House ruler Mercury is tightly trine the South Node. Columbus basically had no respect for private property rights. Combine this with the "no ethics" of his Pallas placement, and we have a potential for extreme criminality. Bloodbath Formula: The above two factors fulfill part of the formula. The Sun, square and ruled by Pluto, fulfills a third requirement. Pluto is also semisquare with the Moon. Pluto, widely square Mercury (ruler of the Second House) completes the formula by a hair. Perhaps Pluto's extreme declination extends his power. Mercury is angular, fulfilling the optional sixth requirement. So Columbus' chart also reflects the fact that he was a mass-murderer, on top of being a thief. Most persons with similar placements don't rise to positions of power and influence and so are not tempted to evil. Columbus had a great deal of power in his sphere of influence, and did a great deal of evil. No birth data is available for Bartolome de las Casas.